When most people think of an archaeological monument, the Great Pyramid of Giza, Stonehenge, and Machu Picchu are usually the most popular to come to mind. However, a new name should be added to the list. 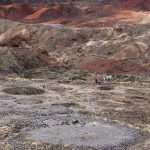 In Kenya’s Lake Turkana, archaeologists have recently been examining several pillar sites, including the Lothagam North Pillar Site. At the Lothagam site, the archaeological team have learned that the platform and pit below the pillared site had been built by a community for the use of a communal grave site. In excavating the grave site, the team found an estimated 580 people, spanning across multiple ages and generations. The site has awed the field of archaeology for it seems that community that built the monument constructed it as a means of uniting the people and an example of an egalitarian society, whereas in the past, it has been suggested that the construction of monuments was a way by upper class rulers to emphasize the hierarchy. (Daley) Yet, perhaps more importantly, it raises the question about the relevance of ethics in archaeology, specifically with the uncovering of human remains. This ethical predicament stems from whether it is acceptable to exhume the dead from their burials when excavating a site and the implications surrounding the cultural context. In the past, archaeologists would commonly disrespect sites of human remains when searching for artifacts, and along the way, collected the skeletons and put them in museums. Because they were no sources of power actively trying to protect their history, many of these skeletons were taken from Native American burials during plundering, and the removal of a body from their places of burial ignorantly disregards the importance of the final resting place in many Native American communities. (Alex) Now, more archaeologists are aware of the gravity of their actions, but the issue still arises for many teams whether it is ok to disturb if it is for the benefit of an scientific discovery. The American Anthropological Association has sought to mediate this problem by emphasizing “People and groups have a generic right to realize their capacity for culture, and to produce, reproduce and change the conditions and forms of their physical, personal and social existence, so long as such activities do not diminish the same capacities of others.” This response to the ethical dilemma puts clear stress on how while they do encourage the research into learning cultural past, they condemn it begins to affects the values and wishes of other cultures. In some ways, we have taken this declaration to heart. The establishment of the Native American Graves Protection and Repatriation Act in 1990 requires the permission of the local community in order for scientists to excavated remains on federal or tribal land. This is a big step in the right direction for achieving the respect Native Americans have been demanding regarding the treatment of their burials, but unfortunately, the law is not regularly enforced and many remains are still taken to museums or reburied. So, how do we begin to further approach an ethical and safe solution for archaeologists? First, by adhering to the demands of Native American groups and other misrepresented cultures around the world when addressing their burial grounds. This also includes respecting their wishes in all research, including online, by not posting images of human bones in case it does belong to one of their people. (Class) Next, we encourage scientific development in excavation tools that will allow archaeologists to investigates, but disturb as little as possible. In the Lothagam site, archaeologists have already found through the study of some the remains that the drying of Lake Turkana forced diverse groups of people to unite and work together. (Alex) This is important for outlining more of the area’s history, but again, it can only truly be successful should it be done responsibly and ethically. Thankfully, that is the case. Read. Smithsonian Magazine, August 22, 2018. https://www.smithsonianmag.com/science-nature/when-their-world-was-chaos-these-ancient-people-coped-building-monument-180970087/, accessed November 4, 2018. 2018 When Is It Ok For Archaeologists To Dig Up the Dead? 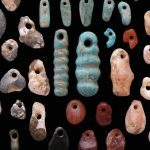 Discover Magazine Blog, September 7, 2018. http://blogs.discovermagazine.com/crux/2018/09/07/when-is-it-ok-for-archaeologists-to-dig-up-the-dead/#.W9-pXS2ZP-Y, accessed November 4, 2018. Since it was rediscovered over 250 years ago, Pompeii has been an intriguing and popular destination for generations across the world. For its most recent resurgence, millennials have manifested their own captivation in site through the 2013 Bastille song about the city and a popular meme currently circulating around the internet. The meme, that began after CNN posted pictures from a dig site, shows an unnamed skeleton who appears to have initially escaped the volcanic ash, only to be then killed by a falling boulder. The irony of the situation inspired many to apply it to their own lives and it became a phenomenon on social media platforms. 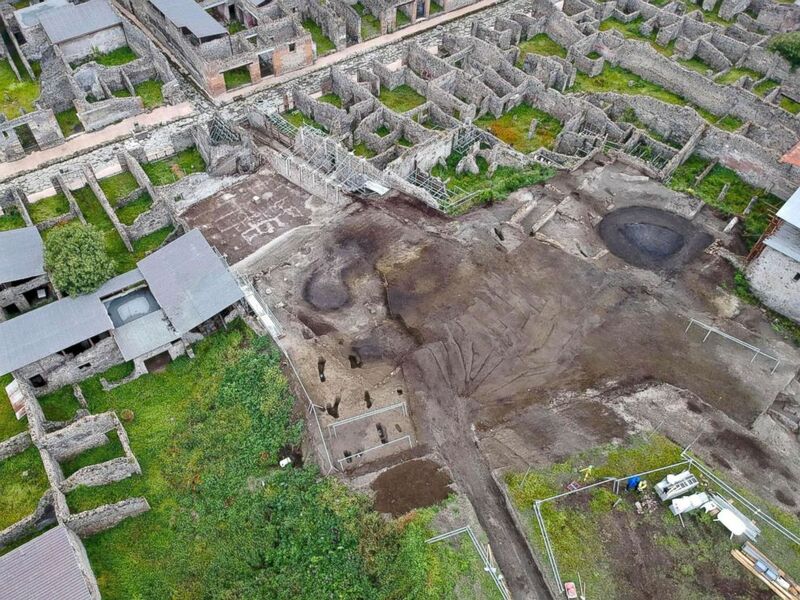 A recent photo of an excavation site at Pompeii, Italy, most likely a similar setting to where the unnamed man was found. Photo provided by The Special Superintendency for the Archaeological Heritage of Naples and Pompeii, May 17, 2018. However, in a Forbes article published in June, archaeologist Kristina Killgrove reports that through examining the skull of the skeleton, the archaeologists found that the man’s skull remained completely intact (Killgrove 2018). This helped them conclude that man had actually not been killed by the boulder, but instead, the upper part of the body had sunk during a previous excavation, causing it to appear that the boulder had been fatal. He most likely died due to asphyxiation. Although this essentially discredits the meme, the study of the man after he was buried led the team to further understand the context of Pompeii and the fate of one of its citizens. This type of inspection–the study of how an organism is buried and the processes that affect it after burial–is called taphonomy, and it remains widely important in the fields of archaeology and paleontology to explain why we find certain fossils and why we don’t, and how that affects the greater scheme of studying the past life (Renfrew 2010:41). 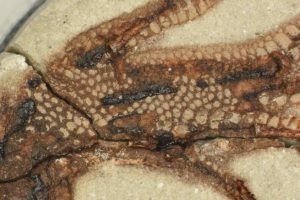 Through greater advances in technology, archaeologists are investigating how to replicate the fossilizing process, in order to better examine and understand decaying, and how one organism becomes a fossil. Evan Sattia of the Field Museum in Chicago explains in a July article for Popular Science that his team is essentially “baking” samples in clay tablets at 3500 psi, which is roughly the temperature of the level of the Earth’s crust where fossils are found. By replicating the process, scientists are able to probe into what temperature, gas, and other environmental effects lead to the fossilizing process and what materials are able to survive, a breakthrough in understanding how we find fossils and why we find them. Although it is sometimes overlooked, taphonomy is a crucial part of the entire archaeological process within a site. The fossils that are left behind, allow archaeologists to peek further into the past living and provide a greater context of the past culture and environment of an area. And as evidenced through technological advances, taphonomy will continue, and should continue, to grow and improve along with further discoveries. 2017 Archaeology as Blood Sport: How an Ancient Mastodon Ignited Debate over Humans’ Arrival in North America. Los Angeles Times, December 22, 2017. http://www.latimes.com/local/california/la-me-cerutti-mastodon-20171222-htmlstory.html#, accessed September 16, 2018. 2018 Here’s How Humans Can Make It as a Fossil. Reader’s Digest, February 15, 2018. https://www.rd.com/culture/human-fossils/, accessed September 16, 2018. 2018 To Understand Fossils, Scientists Are Baking Their Own. Popular Science, July 25, 2018. https://www.popsci.com/easy-bake-fossil, accessed September 16, 2018. 2018 That Meme-Worthy Pompeii Skeleton? Not Crushed By A Block, His Skull Shows. Forbes, June 28, 2018. https://www.forbes.com/sites/kristinakillgrove/2018/06/28/that-meme-worthy-pompeii-skeleton-not-crushed-by-a-block-his-skull-shows/#7a375b9a1c61, accessed September 16, 2018. Renfrew, Colin and Paul Bahn. 2010 Archaeology Essentials. 2nd edition. Thames & Hudson, New York. 2018 Extraordinary discovery of the archaeological site of Pompeii. ABC News, May 19, 2018. https://abcnews.go.com/International/extraordinary-discovery-archaeological-site-pompeii/story?id=55237858, accessed September 16, 2018.